This one of a kind pendant is sure to have you thinking about walks on the beach. The water blue and pale brown make this bohemian style necklace an easy accessory with many color schemes. Wear it with a pair of old jeans as easily as with a flowing dress. The accent bead is also made of glazed stoneware clay. This pendant was created to honour of Cecil the lion. Glazed tan, tan with blue, or blue. Other colours by request. Made from stoneware clay that was imprinted with assorted ocean inspired objects. The glaze is clear over a blue oxide wash. The matching cotton cord is adjustable in length. Choose from round, square (hole on center edge), or diamond (hole on the top corner). Measures approximately 1-1/4″ (3.2 cm). Wear it long, or pull the slip knot at wear as a stunning choker. This design was modelled after a beautiful lone Elm tree that stands on the side of the TransCanada Highway between Winnipeg and Brandon. I etched the tree onto a piece of plaster, making a press mold. The pendant is crafted from stoneware clay, kiln-fired, then hand painted with acrylics. Measures 1-3/8″, on a cotton cord. Length is adustable. Wear it long or short. Select background color from the drop down menu. 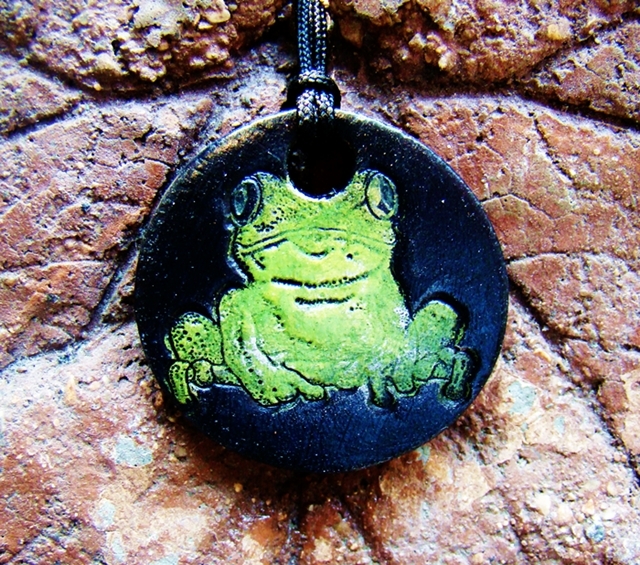 Hand Painted Frog Pendant. Solid color will be provided by default. If you would like a green frog and another background color, please specify when ordering. Each lovely piece of jewelry is made from stoneware clay, kiln-fired, then painted with acrylics. Each pendant has been protected with a varnish. Wash gently to clean, but don’t rub when damp. Pendant piece approximately 3/4″ diameter. Cord length is adjustable. A whimsical unisex pendant, here, shown in black. Select other colors from the drop down menu, or request a custom color. Measures 1-3/8″, on a cotton cord. Length is adustable. Wear it long or short. Crafted from stoneware clay, kiln-fired, and hand painted with acrylics. 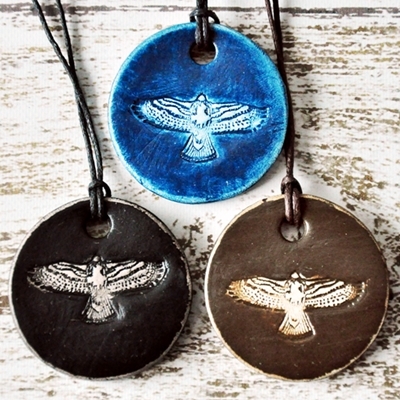 Hand Painted Hawk Pendant (Available in any color). This piece is unisex, and will appeal to most age groups. Made from white stoneware clay, kiln-fired, painted with acrylics, then protected with a water based varnish. Pendant piece approx. 1-1/2″ diameter. Cord length is adjustable. Can be gently washed, but not rubbed when damp. Do not drop ceramic jewelry/buttons on hard surfaces. Will last a lifetime with proper care. A beautiful hand made pendant with an organic look and feel. This one of a kind statement necklace was glazed in a metallic black glaze with contrasting off white and green in the center. One of a kind. The pendant is crafted from stoneware clay and has been kiln-fired. It is ready to wear on its antique bronze chain. Closure is an attractive fish hook clasp. Measures 2″ (5 cm) diameter. Oak leaf pendant with real leaf impression. 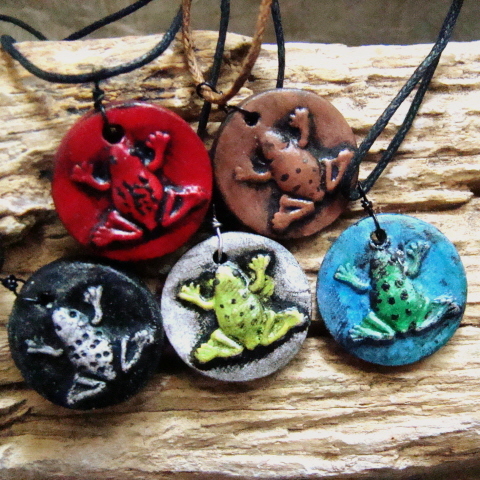 These pendants are crafted from stoneware clay, kiln-fired, then hand painted with durable acrylic paints. Colors are vibrant. Comes ready to wear on cotton cord with sliding knots, allowing for the length to be adjusted. Each pendant measures 2.25″ (5.7 cm) x 1.25″ (3.12 cm). Specify color choice when ordering. CARE–Can be gently washed, but not rubbed when damp. Do not drop ceramic jewelery on hard surfaces. Ceramic jewelry will last a lifetime with proper care. Hand painted pendant, with cheery yellow tulips against a blue sky background. 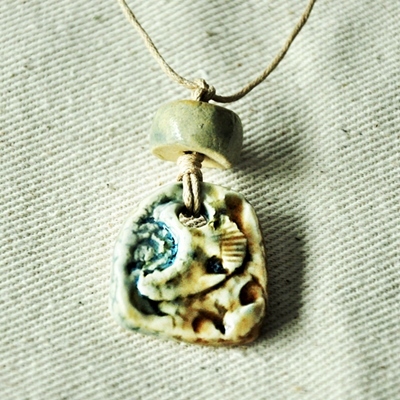 The pendant is made from stoneware clay, kiln fired then hand painted with durable acrylics. The pendant has been protected with a top coat of water based varnish. Ready to wear with a waxed cotton cord. 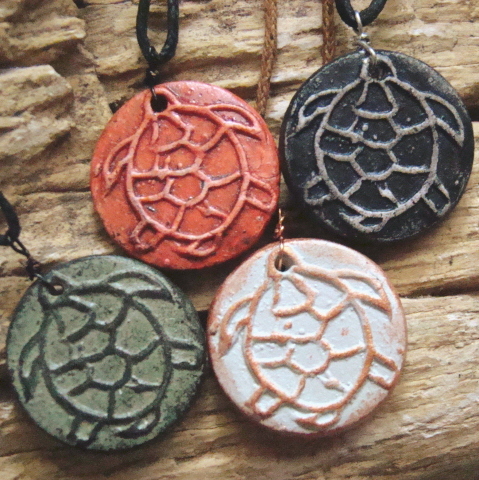 Hand Painted Turtle Pendant Each lovely piece of jewelry is made from stoneware clay, kiln-fired, then painted with acrylics. Each pendant has been protected with a varnish. Wash gently to clean, but don’t rub when damp. With proper care, this lovely adornment will last a lifetime. Pendant piece approx. 3/4″ diameter. Cord length is adjustable. 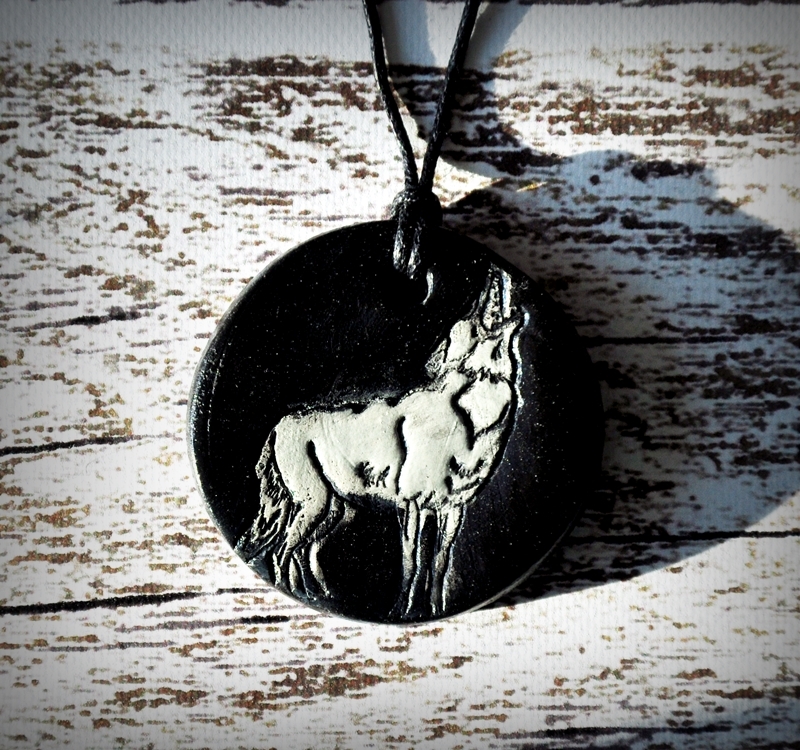 Hand Painted Unisex Wolf Pendant (Available in any color). This Lone Wolf is calling for its pack. Wolves are known for working together, yet also have the quiet strength to stand alone. Made from stoneware clay, kiln-fired, and with acrylics. Each pendant has been protected with a top coat of water based varnish. Made from stoneware clay, oxide washes in blue and pale yellow, and clear glaze over top. A mold was made from the actual yarrow flower. The pendant is strung on a cotton cord and is adjustable in length. Measures approximately 1.5″ (3.8 cm). Wear it long, or pull the sliding knots all the way and wear as a choker.